Chris Trapani got a t-shirt for knocking out Erick Lindgren. And $10,000. A field of 273 registered for Day 1B of the 2011 WPT Bay 101 Shooting Stars, creating a first place prize of just over $1M. Of the 117 Day 1B’s who made it through to Day 2, Chris Trapani (above) ended play as big stack with 197,900. Only nine “Shooting StarsTM” survived, with Chris “Jesus” FergusonTM as the biggest stack with 113,200. 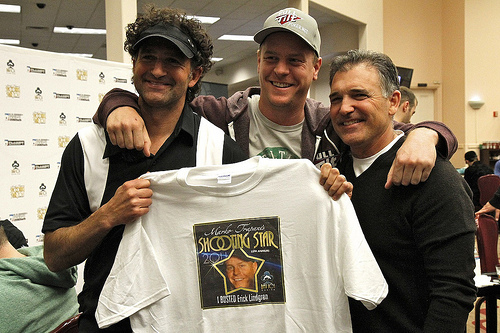 Other notable Shooting Star and non-Shooting Star stacks include Shannon Shorr (147,300), Mike Sexton (83,600), […….] (75,000), Howard Lederer (70,000), Jennifer Harman (62,800), ElkY (62,200), and David Williams (60,500). Nicklas Alf ended with 61,500. Get full chip counts/recap here. Watch the latest Jess & BJ show (“Groundhog Day”) here.